In 2009, LibraryJobline.org began its third year of data collection1. This Fast Facts examines and compares the data from job postings in 2007 and 2008 (Jobline’s first and second year), as well as the number of job postings by month in 2009, at the time of this writing. 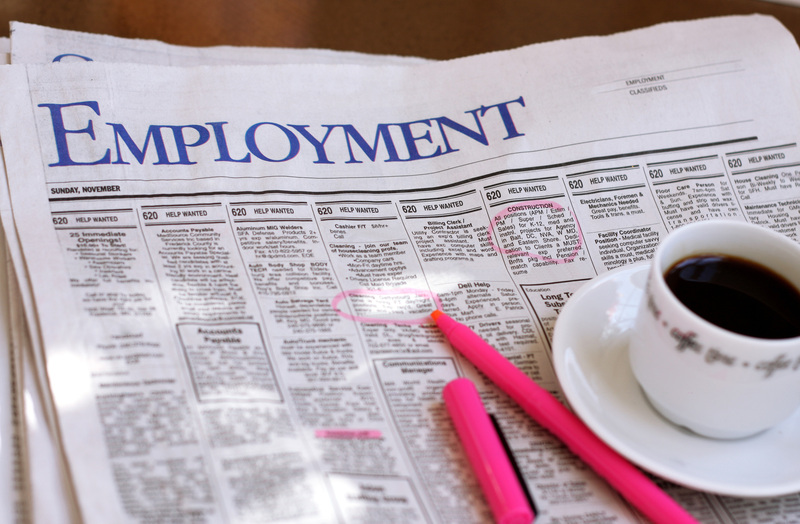 Due to the current economic recession, it is not surprising that job postings have recently decreased. The number of jobs posted in 2008 was down 20 percent from 2007 (see Chart 1). 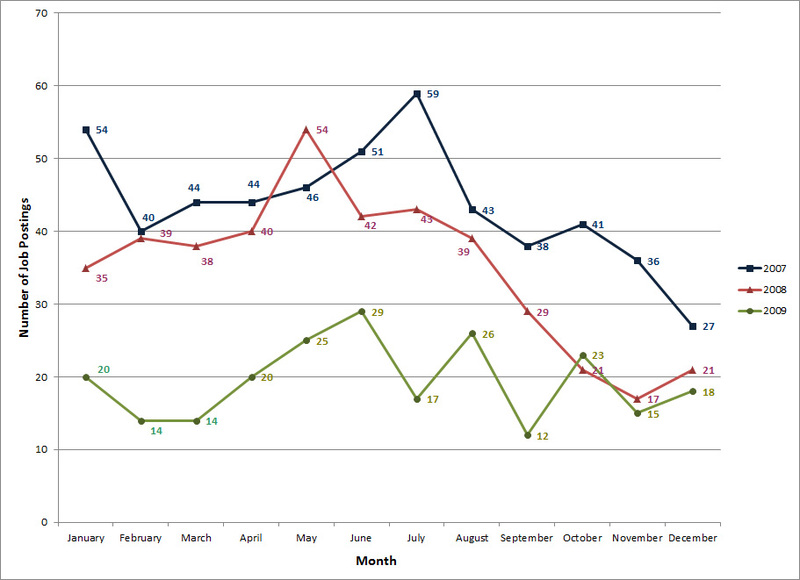 However, a sharp decline did not begin until September 2008. Prior to that, the number of job postings fluctuated, but overall, was similar to 2007. So far in 2009, postings have decreased even more. In February and March 2009, Library Jobline received the fewest number of postings yet for a single month. This may improve, as job postings have been seasonal in the past, with monthly totals peaking between May and August and lessening at the end of the year. As of June 2009, this trend does appear to continue as job postings have increased. However, despite the increase since March 2009, the monthly totals are still less than half of what they were in 2007 and 2008. The percentage of job postings by library type for 2008 changed very little from 2007 (see Chart 2). The minimal change indicates that all library sectors are affected by the decrease in job postings. As in 2007, well over half of the job postings were for public libraries (64%) and academic library job postings (20%) were a distant second. The percentage of all jobs posted that required an ALA-acredited MLIS degree was, again, very similar in 2007 and 2008. However, among the different library types (academic, public, and special) there was a change between the 2 years. 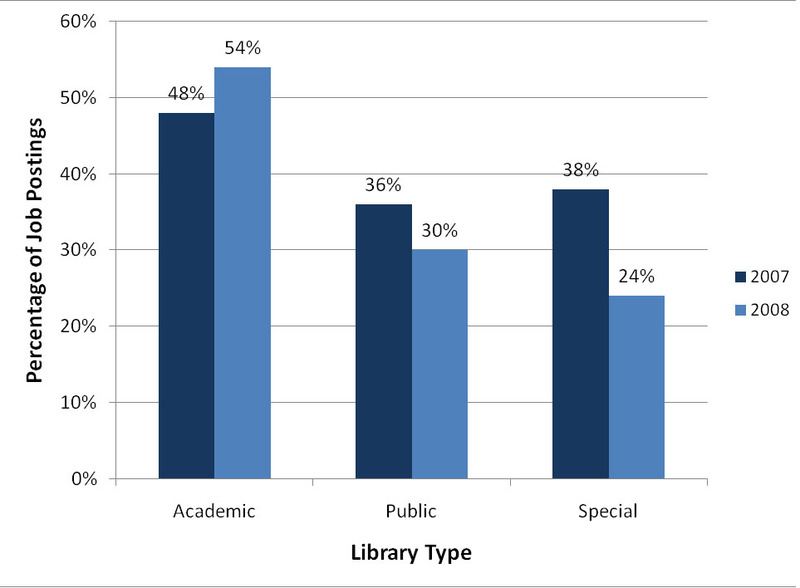 The percentage of postings requiring an ALA-MLIS degree decreased for all library types, except academic (see Chart 3). In 2008, the ALA-MLIS degree was required for 54 percent of positions posted by academic libraries, an increase of 6 percentage points from 2007. Public libraries had a slight decrease in MLIS requirements for jobs posted, which went from 36 percent in 2007 to 30 percent in 2008. Special libraries had the biggest change with job postings requiring the MLIS decreasing from 38 percent in 2007 to 24 percent in 2008. Note: School libraries are excluded from this chart because degree requirements and credentials (i.e. school library endorsement) for librarian positions are often different from other library types. When posting a job to LibraryJobline.org, employers are asked to identify the reason for the job opening. Possible responses are resignation, new position, promotion, or retirement. Resignations were the reason for nearly half (45%) of 2008’s posted positions. Almost 1 in 4 (24%) positions posted were new positions. The percentage of jobs posted due to promotions or retirements was the same in 2008 (each 15%). Overall, the distribution of reasons for position openings in 2008 was almost identical to 2007. The largest changes seen between the 2 years were a slight increase (3%) in retirements, and a similar decrease (3%) in promotions, resulting in a position posted to LibraryJobline.org. So far in 2009, the most frequently viewed job has been a posting for a Teacher-Librarian position with Denver Public Schools. The posting has had 4,181 views to date. The most frequently viewed posting in 2008 was another Teacher-Librarian position with Denver Public Schools, which had 4,330 views. 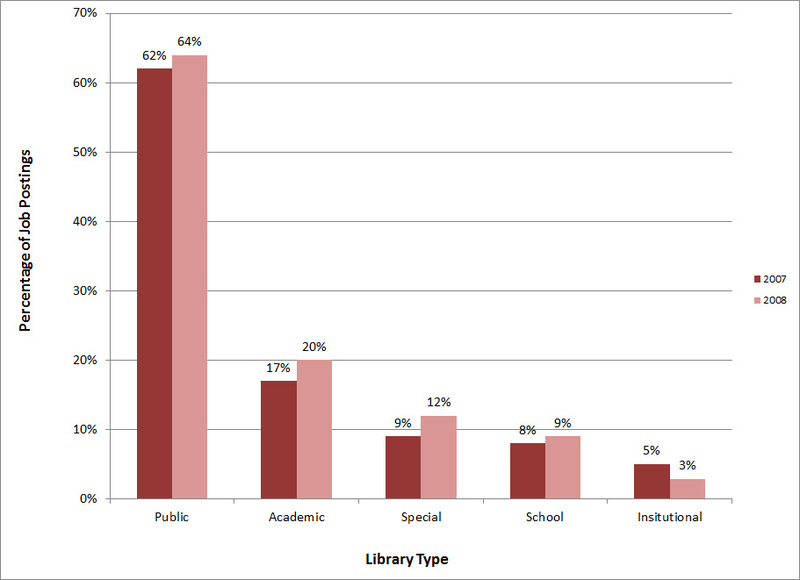 The percentage of school library job postings is so few (only 9 percent of the positions posted to Library Jobline are from school libraries, as seen in Chart 2), that when these positions do appear, they are heavily viewed. In addition, these position listings often include multiple job openings, which may further explain the large number of views for these postings. The most recent hot jobs can always be viewed at http://www.LibraryJobline.org/stats/hotposts.php. The most substantial change during LibraryJobline.org’s second year was the decrease in positions posted, going from 520 in 2007 to 418 in 2008. The economic recession is undoubtedly the main cause for much of this decline. As we move forward LibraryJobline.org will likely continue to reflect the general health of the economy. Although the number of positions posted is lower, the number of users is increasing as more people search for jobs. The total number of visits to LibraryJobline.org in April 2009 (17,155) increased by more than 2,000 from April 2008 (14,932), despite the fact that the number of job postings was less than half. It will be interesting to see how time and different economic conditions affect the positions posted on LibraryJobline.org. Stay tuned.